Yasuaki Hanawa, front left, and other members of the development team surround the latest version of the pitching machine. A pitching phenom with a mind-boggling arsenal that could humble even Daisuke Matsuzaka will debut soon--but only because a pair of companies didn’t want to see such talent go to waste. 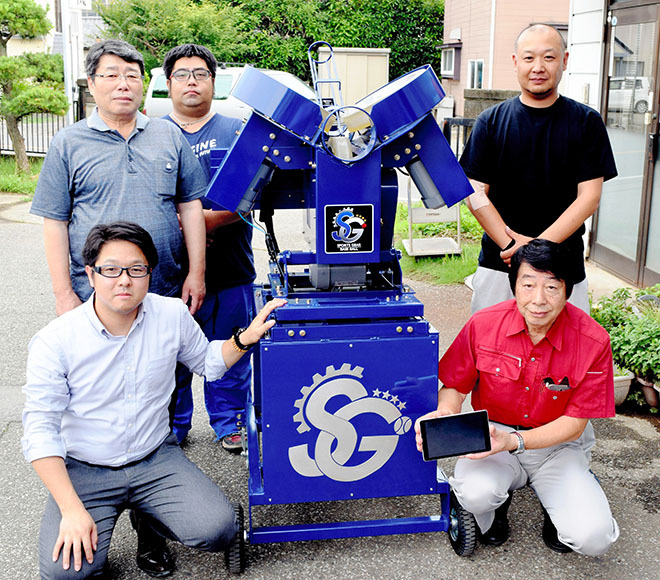 The sensation, a pitching machine developed by Sunaga Kaihatsu Co. in Ashikaga, Tochigi Prefecture, has also kept developer Yasuaki Hanawa, 36, employed. Hanawa had just returned from a sales trip in December 2016 when Sunaga Kaihatsu officials informed him he was out of a job. He had visited high schools and professional baseball clubs around Japan to inform them about the pitching machine that he helped to create. The machine can serve up 160-kph fastballs and has a selection of 400 different pitches with uncanny control and changing speeds. Faced with the prospect of unemployment, Hanawa had no idea how to proceed. That was when two companies he had business dealings with stepped up to the plate and proposed a plan to create a new company to handle manufacturing and sales of the pitching machine. Sports Gear Inc., backed by Fujimoto Seiki Co. of Ota, Gunma Prefecture, and Aruba Denshi Co. of Ashikaga, was set up in February with Hanawa as company president. Sunaga Kaihatsu was established in 1977 and was part of the Sunaga Hanabi Co. group, which was formed in 1927 to manufacture fireworks. Sunaga Kaihatsu’s pitching machines had involved two wheel-like rotors that ejected the balls. The first model was completed in 1978. A later model completed in 2010 used three rotors, opening up the possibility of a wider range of pitches. The SR-91 was beloved by some of the strongest high schools in Japan, including Chiben Wakayama, Osaka Toin and other regulars at the summer national high school baseball tournament held at Koshien Stadium in Nishinomiya, Hyogo Prefecture. Before the SR-91, pitching machines could only offer up three or four simple off-speed pitches. The SR-91 had an arsenal of 15 different pitches, including a sinker and two-seam fastball. Sunaga Kaihatsu improved on the SR-91 and was planning to come out with a new model in early 2017 that could throw several hundred different pitches with untiring resilience. However, poor sales led to a stoppage of business operations in January, and Sunaga Kaihatsu filed for bankruptcy in March. Sports Gear now plans to sell the new model from September for a standard price of 1.45 million yen ($13,000). While other pitching machines develop sloppy control the faster the balls are thrown, the new model can still hit the strike zone when the pitches reach 160 kph. Another option will make it easier for those operating the machine. Previously, pitching machines had to be set for each pitch. 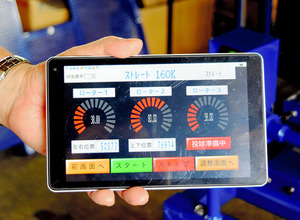 But the new model comes with the option of a tablet computer, on which the type and number of pitches can be pre-programmed from the bench. Sports Gear said the machine can be adjusted to copy the pitching styles of some of the best pitchers in the professional ranks and at high school tournaments. Harumi Kogure, 66, president of Fujimoto Seiki, is proud of the new model. “It is the result of combining a good idea with technological ability as well as seeking out a new challenge,” Kogure said. Hanawa is visiting high schools around Japan to pitch the new model.